Posted by on Monday, June 29th, 2015 at 2:26pm. • Clean up. Trim plants and pull weeds to clear your garden space. Wash away dirt and cobwebs from your sidewalks, driveway and walls. Mow and manicure your lawn. • Replace old furnishings. Update your mailbox, address numbers, lockset and lighting fixtures. New gutters and rainspouts also make your home look new and functional. • Emphasize your entryway. Paint or replace your front door to draw the viewer’s eye. Polish doorknobs, knockers and other metal furnishings. Dispose of old or dirty welcome mats. • Paint. A new coat of paint makes your home look fresh. Even updating the trim improves your home’s overall impression. • Glamorize your windows. 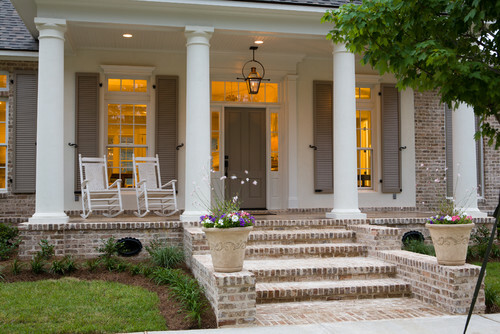 Shutters and window boxes make your windows look decorative as well as functional. Clean the glass from both sides to ensure your windows gleam. • Create a dynamic garden. Add new mulch to your garden or planter beds to restore color in the soil. Update edging and borders with new stone or brick. Cover dead spots beneath trees by planting flowers that thrive in shade. • Add outdoor lighting. Illuminating walkways and flower beds adds a welcoming allure to your home in the evening. • Don’t neglect the driveway. Use sealant to repair any cracks in a concrete driveway. Stain old or discolored driveways to make them look new. Paint or update your garage door. • Move everyday utility objects. Hide trashcans and recycling bins in your backyard or around the side of your home. Wind garden hoses into neat coils. If you have a showing, move your car out of the driveway to create a picturesque view of your home. Call us today if you’re ready to show your home!